Join the biggest tar sands protest the northeast has ever seen! Saturday Jan 26: March and Rally in Portland, ME, 11:30 to 3pm (note time change). Meet at 11:15am at Monument Square. The March is approximately 0.7 miles – click here for route. ExxonMobil is gearing up to move dirty tar sands oil east through Ontario and Quebec into New England to reach a shipping port in Portland, Maine. But the people of eastern Canada and New England have their own plan and are are forming a wall of opposition to keep the east tar sands free. Solidarity actions in the US and Canada continue on January 26th! Find an action in your area. 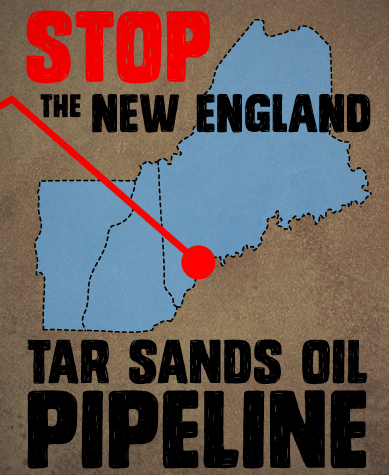 President Obama must keep Tar Sands out of New England by refusing to issue this pipeline a new Presidential Permit. This will be the largest cross-border pipeline action the northeast has ever seen! Sign up to be a part of these historic actions. Sign the Pledge to Resist the Tar Sands in the northeast. Sign up for the 1/26 bus from Boston to Portland. Click here to request or offer a ride to Portland on 1/26.